i've made my own beef-bone stock for yrs, but never thought to roast the bones until i stumbled across this recipe. i used whatever was on sale: beef marrow bones, and beef spare ribs, didn't have any parsnips so i omitted them. Added a whole bulb of garlic along with the roasting part. The stock came out AMAZINGLY AWESOME. 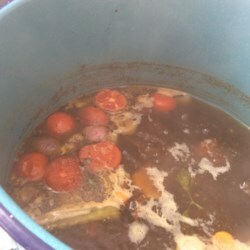 The roasting gave the stock a whole new dimension of flavors and gave the stock a beautiful caramel color that my previous bone-stock recipes lacked. The roasted garlic scent was very obvious, i thought it added depth to the stock, but it might be too overpowering for non-garlic lovers. But overall, it's a beautiful stock that's worth the effort.